I was out doing some work about the house the other day, and while I was getting some stuff ready for the bin, my hobby filter kicked in and brought a halt to the work while I scrutinised a piece of broken plastic. Mine is probably on any time I'm not asleep. You most likely have one too if you're reading this. That little voice in the back of your head that evaluates almost everything for hobby value. Allow me to elaborate. You're walking along the beach and you notice some shells. You think: "They'd look great on the base of my daemon prince." You can never walk past a pet store in case they have some fish tank plants or decorations that can be used as scenery. Every plastic take out container is cleaned and pressed into service as a miniature box. You can't visit a hardware store without looking at glues, blue foam, cork sheeting and filler, but not for DIY. Every time you see a movie with knights/lasers/Roman soldiers you're looking at it in terms of a painting guide/next army inspiration. If you're with me still, you know the score. Anyhow, back to scrutinised broken plastic. I held this up for a good two or three minutes. The more I stared, the more I could see, with a good mdf base, come cutting and a couple of little additions, I'd have me a pretty good ruined building. Extra floors could be added too. These plastic baskets are in almost every hardware store, and you could easily make 3 or 4 big ruins sections with them. You'd have that ruined cityscape up in no time. 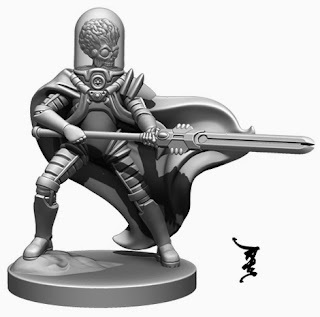 At the time of writing there are 11 days left on the Mantic Games Mars Attacks kickstarter. I was in on day 1, but then, I do love the Mars Attacks universe. You don't get too many tongue in cheek pulp sci-fi games at the moment, especially set in modern day. There have been quite a few stretch goals broken, not the least of which is the 6.5" Martian robot complete with clear canopy so you can see the pilot and controls. You can get it for $20 in one of the deals, which for a miniature that size is peanuts. There are saucers, Martian marines, a veritable pile of human heroes, burning cattle and a pile of other add ons and upgrades. Hopefully some giant mutant bugs will appear if the pledge level gets high enough. The thing about this particular game is it looks to function as either a boardgame or wargame, depending on what you want from it. The Escalation expansion increases the playing area and introduces new troop types and vehicles. The various accessories include modern scenery as well. Dumpsters, trash cans, crashed cars, ruins etc, will work for a variety of games, as will the US marines included in the base game. I'm in for the hordes of Martians meself. 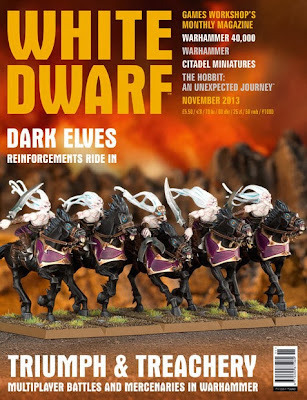 I don't normally review White Dwarf, but this month there's so much in it that I'm looking forward to that I think it's worth it. The dark elf second wave breaks this month, which has to be one of the most comprehensive race reboots GW have done since the dark eldar. I think the range look great, there's a lot of nods to the older ranges of dark elves, and the new units, especially the warlocks, look fantastic. I can see myself using those sisters of slaughter heads for something in the future too. Great cultist heads, methinks. The thing that really gets me interested this month though, is the warhammer expansion, Triumph & Treachery. Multi-player, with a deck of back-stabby game event cards and an interesting victory mechanic in the form of coin counters could be very good. There's also access to mercenaries, 100 points for every 500 points in your army, I believe. I do like that even if you're allied with another player, only the player with the most coins can win. Fingers crossed that this is a decent expansion to the game. Another exciting release are the new Special Effects Paints. Two rust types, verdigris, gore, a type of crackle paint and a glossy pus paint are the choices. I'm quite eager to try these. At the moment I mix my own flavours of rust, gore and verdigris, so I'm pretty keen to see how these rate. I'm also interested in crackle paint, as I think it has a multitude of uses, from cracked paintwork to shattered armour. 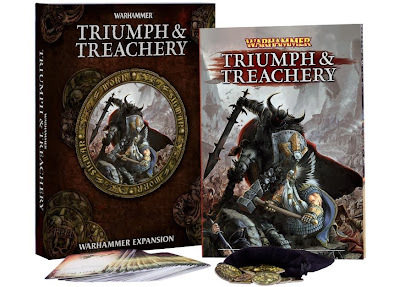 There's a Triumph and Treachery battle report to show off the new expansion,and it does look a lot of fun. For the painters, there's a lot of eye candy in this issue, as well as an article on the new effects paints. All in all, a pretty good issue for the warhammer player and hobbyist. In an effort to re-start the painting engine, I've been looking through my miniatures cabinet for some inspiration. I've never photographed many of my older miniatures, so I though I'd include a few here from time to time. There's a lot of retro marine love going about at the moment, so I thought I'd pop up a shot of a squad from my first 40k army, the legion of the damned. 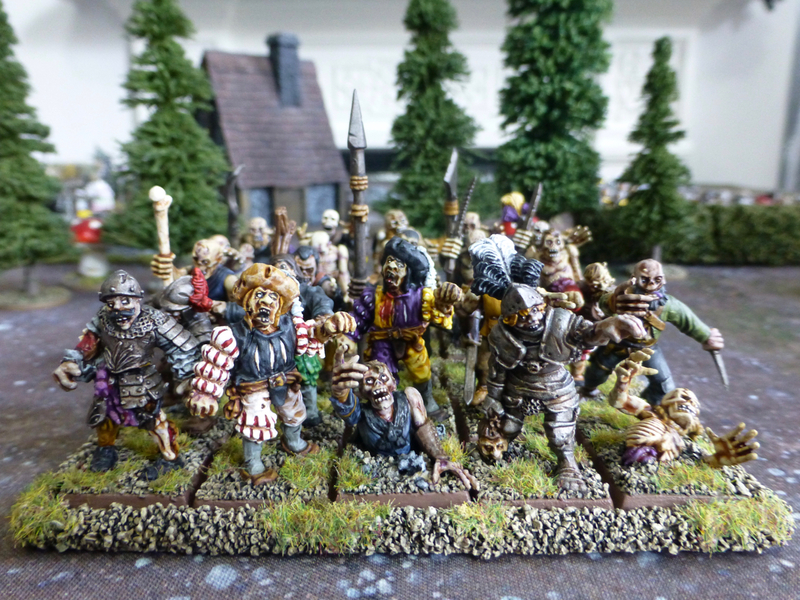 These lads were painted back in 1992, and as such have seen a lot of action over the years. I'm still a little in love with the old RTB01 space marines. Beaky marines are by far my favourites. Happily I have a pile of them in a box if I ever decide to do more. Every hobbyist goes through the doldrums at some point. Right now, it's my turn. Following a frenzied painting marathon up to the end of September I find myself drifting a little, my brushes, paints and greenstuff untouched for the last few weeks. Yes, I probably burned myself out a bit. So, what can be done? It probably doesn't help that I left myself such treats as movement trays to finish up. There's no doing anything else either, I have a little pile of army housekeeping to get done before I get onto anything else. And the 'anything else' has becomes more alluring by the day. 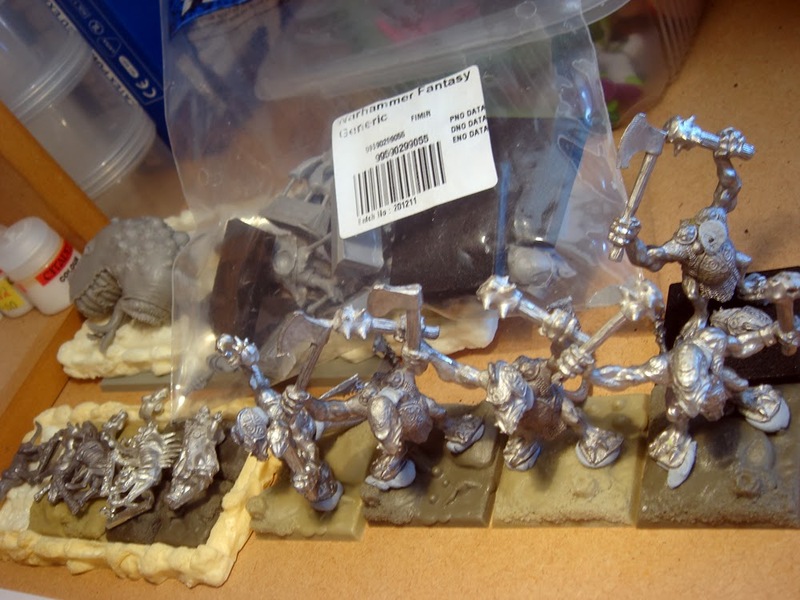 I am looking at a 50 block of old school metal Citadel skeletons to start getting my long neglected vampire counts up to speed. There's a unit of 8 fimir nobles including the Forge World fimir calling for paint. 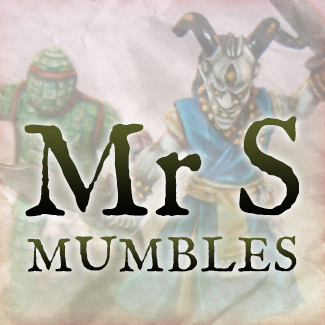 I'm really wanting to paint a squad of Rogue Trader era Nurgle renegades. The assembled pieces of Balor want building and painting. 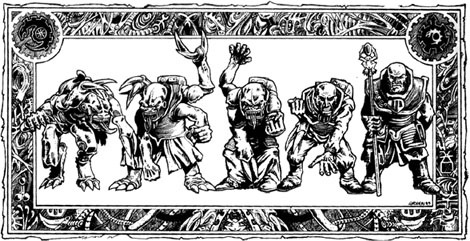 I have a unit of eight crypt horrors made up of metal undead ogres, trolls, minotaurs and so on that have been in the to do pile for some time. The marlwyrm champion needs converting and some sculpting. 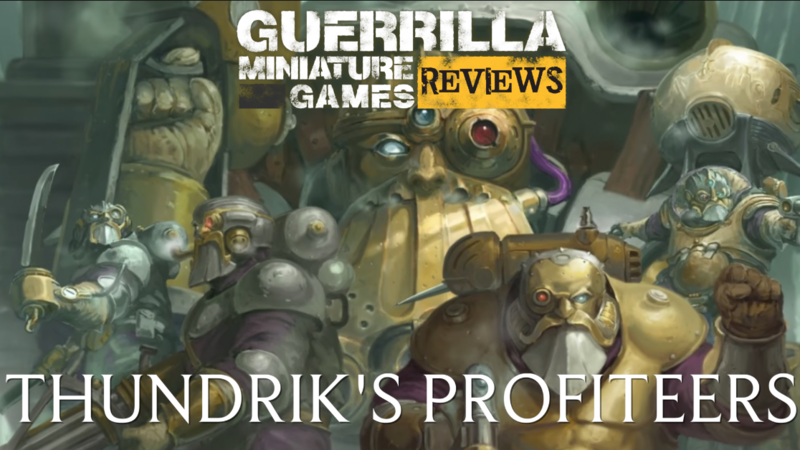 There's a squad of genestealer hybrids needing some love. All this, and I can't summon the momentum to lift a sculpting tool or paint brush. 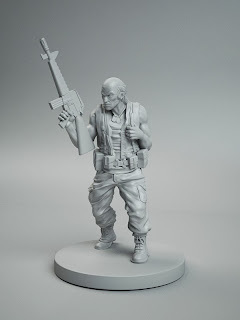 Fimm, of Fimm McCool's Games Orkshop will soon be releasing his range of fenfolk. My interest in these models should be pretty obvious. There's a standard bearer and a wonderful fimi- um, fenfolk piper there that are going right in my second fimm unit. There's a lovely Dark Crystal vibe about these models, there's even a beetle-like woodlouse model that looks suspiciously like a Garthim. Here's some more shots of the assembled models. 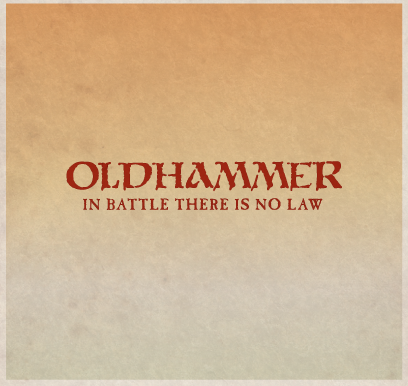 If you want some, go over to Fimm's blog or this thread on the Oldhammer forum. Not the cover. Just a nice picture. Out of the blue I hear of a new expansion for warhammer devoted to multi-player games coming out in November. I'm always interested in non-army book releases, as occasionally they are great. The General's Compendium and Blood in the Badlands (for the siege rules) being some examples. Here's hoping this is a good one, as while I love the idea of multi-player games, they tend to be a little bit clunky, especially when it comes to the magic phase. Interesting that it's three or more players. 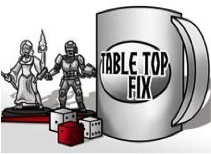 How would a three player game set-up work on a 6x4, I wonder? Triumph and Treachery is an expansion that allows 3 or more players to battle upon the tabletop… and in the end, there can be only one. 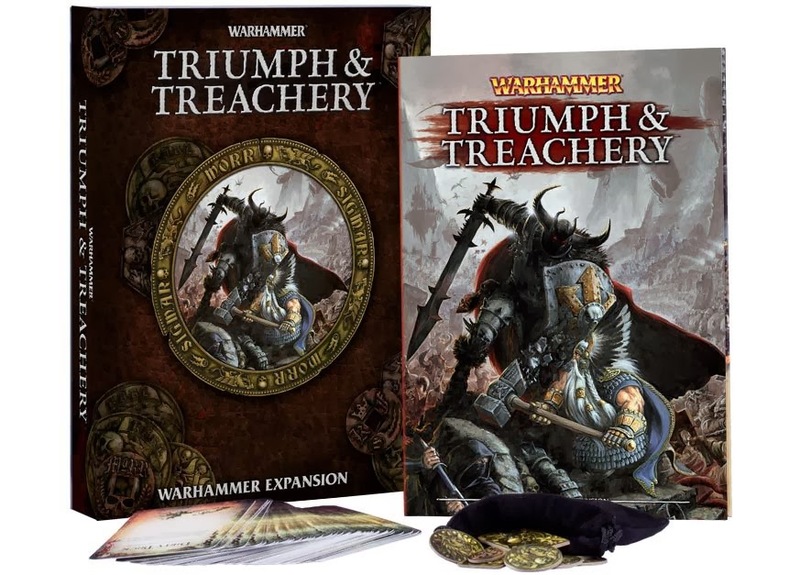 Its a hardcover expansion book, that comes with a deck of 36 game cards, 5 player turn cards, a pouch of game victory coins, a book with galleries, new artwork, examples of battles, and the rules for playing Triumph and Treachery with 3-5 players. The cover of the book is a Dwarf fighting a Chaos Warrior in combat, with a Dark Elf Assassin sneaking in behind. Genestealer Cult Supplement for 6th Edition 40k? Could it be true? Ever since the Iyanden supplement came out I've wondered would GW do the right thing and bring out a genestealer cult supplement on the back on the tyranid release. It looks like it's certainly a possibility. I can see this being a HUGE success if it does happen. It would certainly get me in gear to kick off the Order of the Dawn, my own cult. For me it would be for 40k what fimir are for warhammer fantasy. 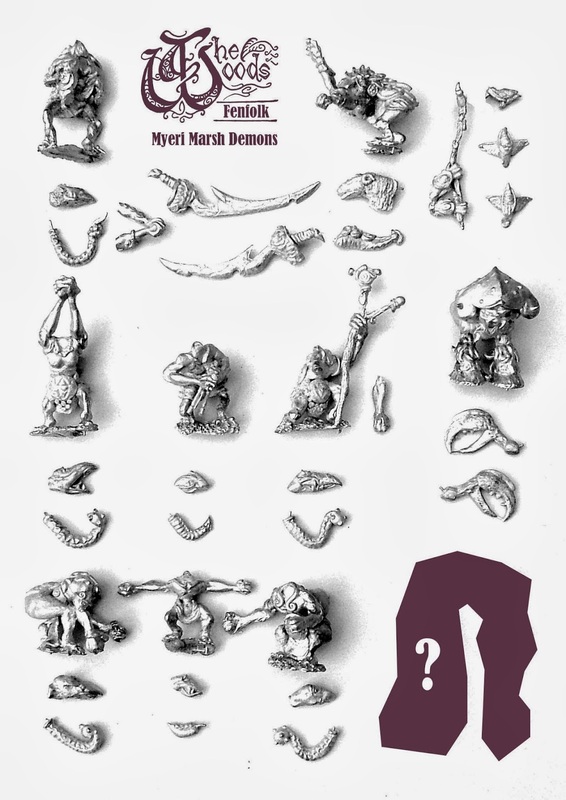 The first "hybrid supplement" - this book will be a combined book for IG and Tyranids. It allows both codices to ally, but heavily restricts units selections on both. Look for smaller "infiltration bugs" such as Genestealers, Broodlords, Lictors and such from the Tyranid side while the Guard are very heavily restricted on units and heavy equipment. 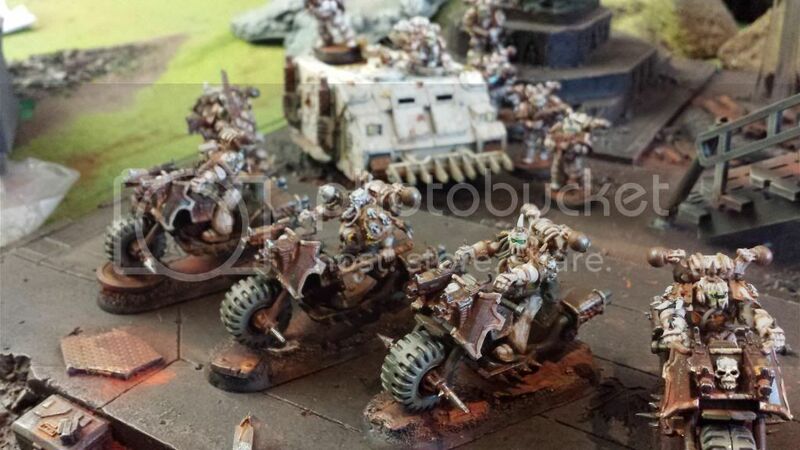 The list's HQ must include a psyker warlord from either the IG or Tyranid units allowed. A new psychic power list is included. After twenty minutes the Mars Attacks Kickstarter went live it's funded and as I write the first stretch goal is down. That's pretty fast work. 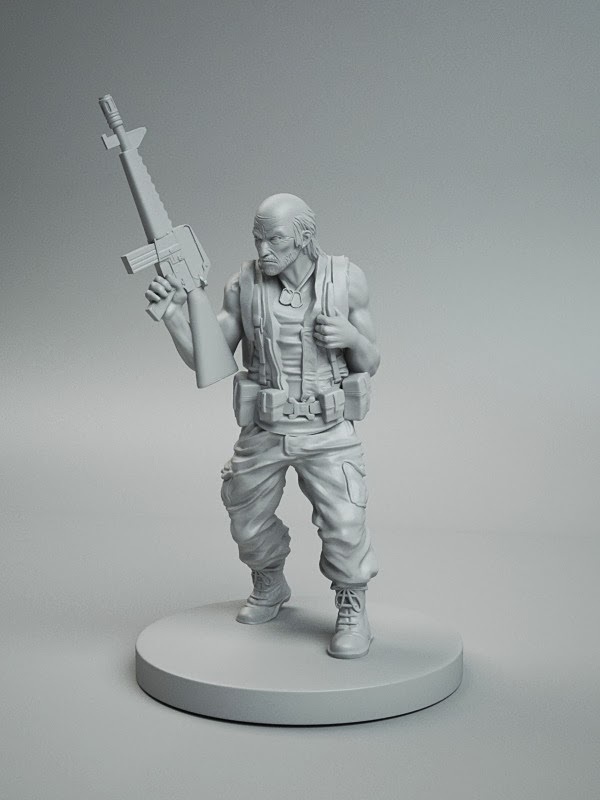 The basic set contains a 2'x2' gaming matt, plastic ruins, eight Martian grunts and eight US soldiers as well as four special characters, 1 Martian, 3 human. Dice, rules, cards and counters finish off the boxed game. 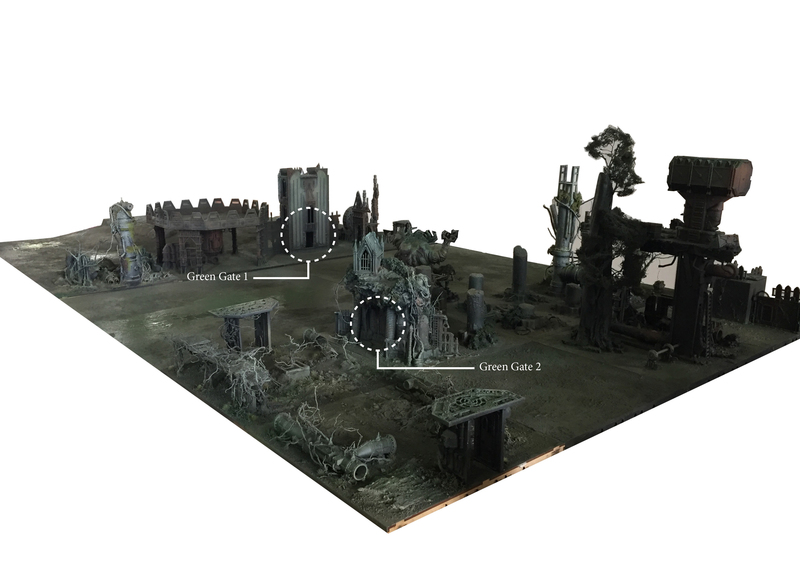 With the $100 pledge you also get $50 to spend on core add ons, more human or Martian troops, or more scenery. I imagine this will expand as the kickstarter goes on. I look forward to seeing saucers, giant robots, mutant bugs and more human forces, as well as hopefully more special characters. 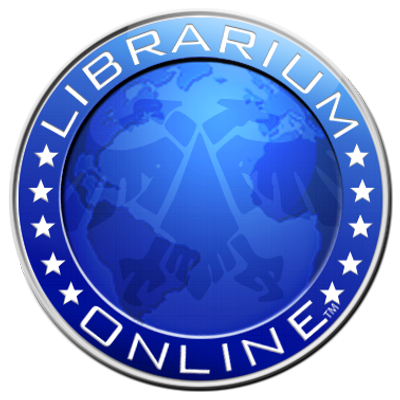 John O'Connor of the Witchblade blog has some great coverage of NWG including a ten minute video, worth a look! Catch it here. 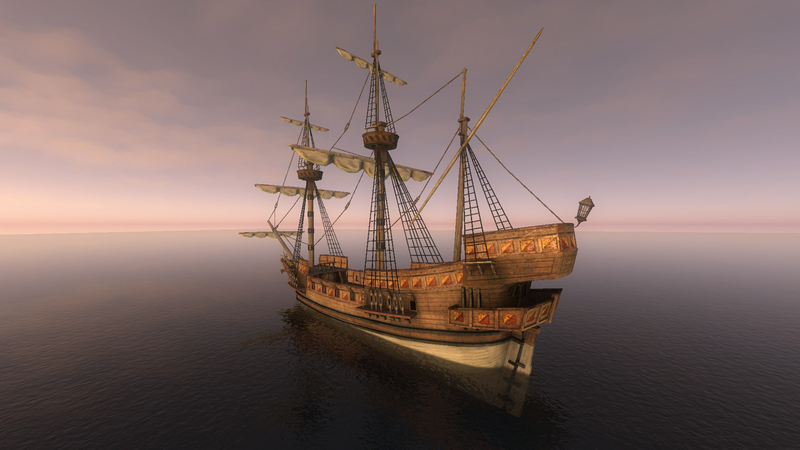 Now that the dust has settled, it's time to decide what to do next with the fimir. As I already mentioned here, I do have some tidying up to do before I get into the next new unit. 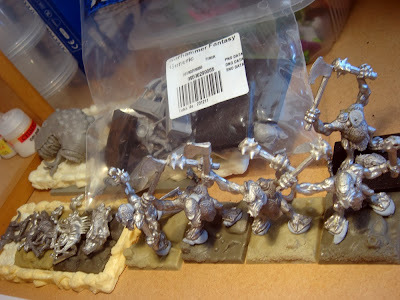 I've been mulling things a bit though, and I've decided that there is one unit I kind of want to do before doing starting on more sensible additions to the army, a unit of fimir nobles who will be fielded as chaos ogres. You can see what I've got here. I have five of the original metal nobles and three forge world fimir. I'll need to convert a standard bearer and musician, probably using ogre bits. I found I'm a bladed tail short, so if anybody out there has a bladed fimir tail they want to trade or sell, give me a holler. Another idea is swirling about my head after seeing all the fantastic display boards at NWG. I'd think I'd like to do cool board for the fimir. A sacrificial pool ringing by a crumbling stone circle is the current notion, with a stone outcrop set above the pool where sacrifices can be hurled into the depths. The henge would be ancient, with some of the stones collapsed or listing into the swamp. I'd love to add all kinds of little details, bronze vessels, weapons and the bones of victims visible under the water at the edges of the pool, sunken stones with hidden half-dead gazing out from the vegetation and all kinds of other bits. I've already looked into getting fimir-themed Celtic knotwork etched in brass to go around the edge of the board. It'll take a while, but I think it would be worth it.